You know those street performers that put plates on sticks and make them all rotate at once? I imagine that's pretty hard to do, because you have to pay attention to so many variables at the same time. I say "I imagine" because if I tried it I'm pretty sure I'd break the whole lot of my expensive IKEA dishware. Dungeons 2 is a bit like those plates, asking you to pay attention to a dozen different things at the same time. Needless to say, I'm terrible at it. The game does provide an interesting (and unique) challenge though. 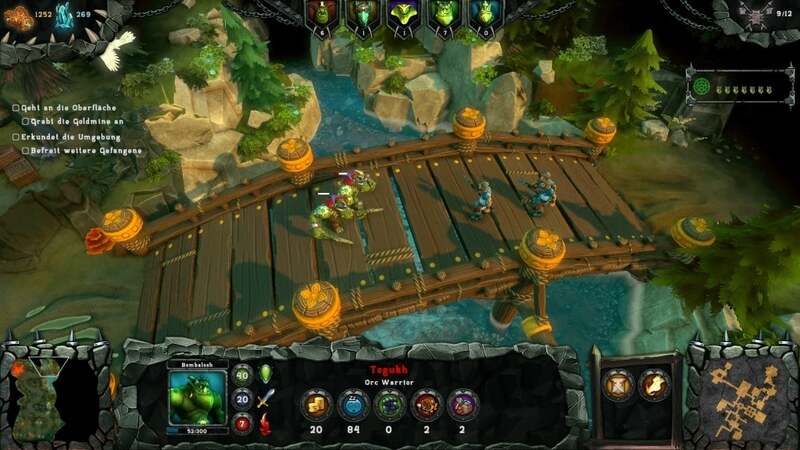 Dungeons 2 is actually two games. 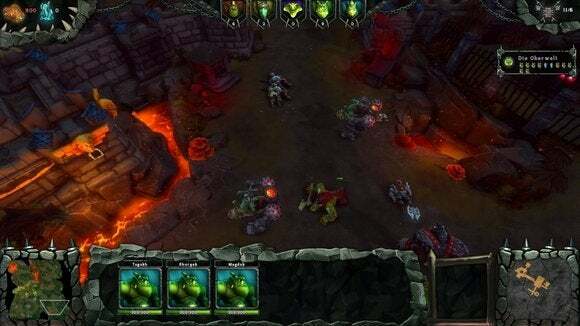 Half the game is similar to the original Dungeons, which is to say it's similar to EA's classic Dungeon Keeper. You're lord of a small underground fortress which quickly (with the help of your loyal goons) expands into a massive labyrinth of treasure vaults, breweries, workshops, and other assorted areas to keep your underlings happy, healthy, and productive. This section of the game relies on indirect control of your minions. You'll designate a section of rocks you want excavated, for instance, but it's up to your minions to decide which ones are going to complete that task. Or you'll say that your workshop needs goblins to research new traps, but your goblins will do so without your intervention. Your only real interactions in the dungeon view take place through a massive floating hand, with which you can pick up and drag minions to new areas, slap minions, or select new structures to build. There's still plenty to do though, as you're constantly expanding your holdings, constructing traps, shoring up your defenses, or creating new minions. ...At which point Dungeons 2 turns into a real-time strategy game. You're controlling the forces of evil, invading a hyper-saturated land of bunnies and butterflies. Each time you conquer a new section the ground will corrupt around you, so you can watch your dark influence spread with each victory. The game controls like a typical real-time strategy game too. You control your troops directly, ordering them around the map and fighting pitched battles against those damn do-gooders. In our hands-on demo, the first task involved seeking out the once-mighty Naga faction and requesting their aid. Keep in mind that as you Lewis and Clark your way across this strange overworld your dungeon keeps working in the background. You can swap back and forth between the two views instantaneously by clicking on either of the two respective mini-maps. Even so, it's an almost overwhelming amount of stuff to pay attention to—you might switch to your dungeon to construct more troops only to switch back to the top layer and find your existing orc army in a heated conflict with a half dozen knights. There are also times where you're forced to explore underground—helping the Naga, for instance, requires you to recover a valuable mana stone from an old abandoned base. 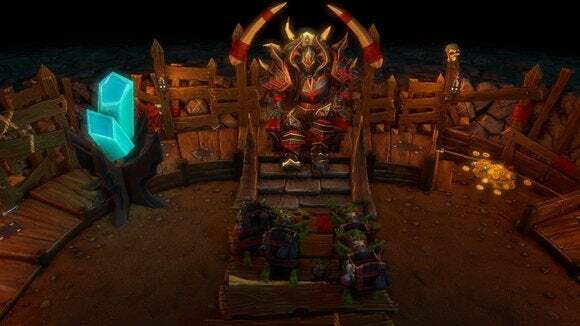 Going underground returns you to the original Dungeon Keeper style of interaction, disallowing direct control of your troops. The same applies when the forces of good come and invade your realm. 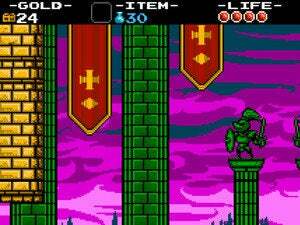 It's an interesting and stressful blend of two different game types, and definitely feels like a step up from the original Dungeons. I'm particularly intrigued by multiplayer, where four players will start underground and then battle it out on the overworld map. 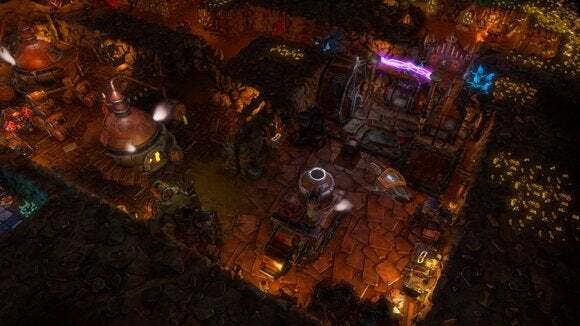 Provided developer Realmforge gets the balance of various units right, it could make for a pretty wild multiplayer game—you wouldn't know what you were in for upon invading another player's dungeon until you were already down there, and by then it's too late. Look for this one in early 2015. It's already looking way better than EA's crappy free-to-play Dungeon Keeper sequel.